Maps communicate information about the world by using symbols to represent specific ideas or concepts. The relationship between a map symbol and the information that symbol represents must be clear and easily interpreted. The symbol design process requires first an understanding of the underlying nature of the data to be mapped (e.g., its spatial dimensions and level of measurement), then the selection of symbols that suggest those data attributes. Cartographers developed the visual variable system, a graphic vocabulary, to express these relationships on maps. Map readers respond to the visual variable system in predictable ways, enabling mapmakers to design map symbols for most types of information with a high degree of reliability. This entry was published on June 14, 2017. This Topic is also available in the following editions: DiBiase, D., DeMers, M., Johnson, A., Kemp, K., Luck, A. T., Plewe, B., and Wentz, E. (2006). Basic concepts of symbolization. The Geographic Information Science & Technology Body of Knowledge. Washington, DC: Association of American Geographers. (2nd Quarter 2016, first digital). graphic primitives: the basic graphic marks or elements that can be used to create most symbols (points, lines, polygons). haptics: related to the sense or use of touch. level of measurement: the numerical property of a measured attribute or variable. nominal: categorical data, unordered and non-numerical. ordinal: ordered or ranked data with no assigned numerical values. interval: numerical data with an arbitrary zero point. ratio: numerical data with a non-arbitrary zero point. referent: an object or phenomenon a symbol represents. spatial dimension: the measureable extent of a symbol or phenomenon in space. symbol: a mark or sign that represents an object or phenomenon. symbolization: encoding something with meaning in order to represent something else. 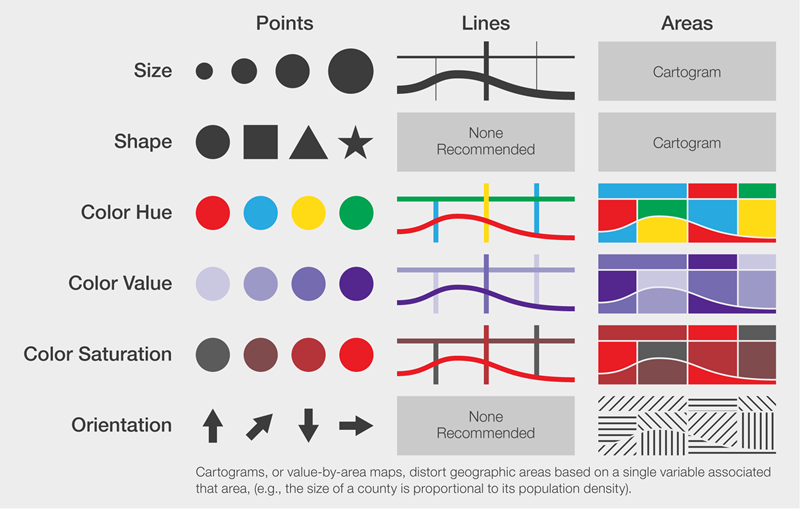 visual variables: a set of graphic marks used to symbolize data. size: Variations in the length, area, or volume of a symbol. shape: Variations in the appearance or form of a symbol. color hue: A dominant wavelength of visible light (e.g., red, blue, green). color value: Light or dark variations of a single hue. color saturation: The intensity of a single hue. orientation: The direction or angle of rotation of a symbol. arrangement: The distribution of individual marks that make up a symbol. texture: The relative coarseness of a map symbol. transparency: The blend level of a symbol and a background layer. crispness: The sharpness of boundaries. resolution: The level of detail or precision of a spatial data set. Symbolization is the process of encoding something with meaning in order to represent something else. Effective symbol design requires that the relationship between a symbol and the information that symbol represents (the referent) be clear and easily interpreted. Cartographers developed the visual variable system, a graphic vocabulary, to express these symbol-referent relationships on maps. Map symbols take many forms. An ideal map symbol is one that requires minimal effort to decode and perceptually match to the information the symbol represents. Fortunately, readers tend to respond to the visual variable system in predictable ways, enabling mapmakers to design map symbols for most types of information and be confident that those symbols will be perceived and interpreted as intended. Variations in the perceived differences (and importance) of symbols allow designers to represent a large variety of referential data. To design an effective map symbology, the mapmaker must carefully distinguish between two uses of visual variables and graphic primitives: 1) using them to encode information, and 2) using them as elements of graphic design. In the first case, variations in the appearance of symbols should represent variations in the data, which a legend can help decode. In the second case, variations can be used to draw the reader’s attention or establish a strong visual hierarchy (the figure-ground relationships between all elements in a map). For more information on this topic, see the entries on Visual Hierarchy, Layout, and Map Elements and Aesthetics & Design (forthcoming). Effective symbol selection requires matching the characteristics of a symbol with the underlying nature of the geographic referent being mapped, particularly the spatial dimension and level of measurement of the data collected to represent that referent (MacEachren, 1994; Slocum et al., 2009). 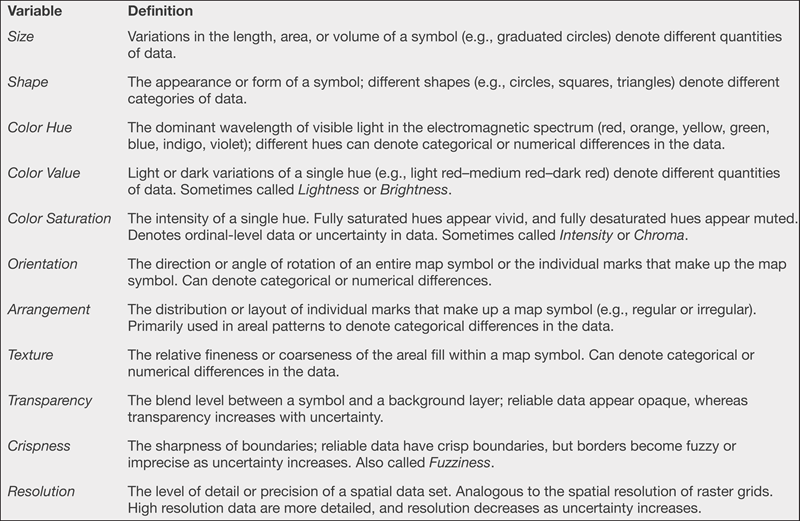 These data characteristics function as criteria to determine which visual variables may be selected to create an effective map symbol. For discussions of other symbol selection criteria, see Scale and Generalization, Statistical Mapping, and Aesthetics & Design (forthcoming). Data collected to represent phenomena can be grouped into four basic spatial dimensions: point (zero-dimensional), linear (one-dimensional), areal (two-dimensional), and volumetric (three-dimensional). These spatial properties neatly overlap with the graphic primitives used to create most graphical symbols: points, lines, and polygons. For instance, census tract data are areal in nature, and thus typically represented using polygonal map symbols. Importantly, data dimensionality is scale specific. For instance, cities may occur at points on a small-scale map, but on a large-scale map it is more logical to display their “footprint” or areal extent. For these reasons, while mapmakers should attempt to match symbol dimensions with phenomenon dimensions, they must also ensure the selected symbolization method is appropriate for both the data collection method used and the intended map scale. Data are typically classified into one of four empirical levels of measurement, which refers to how a phenomenon or variable was measured: nominal, ordinal, interval, and ratio. Each successively higher level contains all the characteristics of the lower levels. Nominal data, the lowest level, are categorical or qualitative in nature, and have no natural or implied order; religion or primary language are examples of nominal categorization. Ordinal data, the second level, have an ordered or ranked relationship (something is more or less than something else), but there is no numerical difference between any two positions in that order; the terms low, moderate, and high indicate ordinal differences. Interval data, the third level, are numerically ordered (any two positions have precise numerical differences), but the interval scale contains an arbitrary zero point; the Fahrenheit and Celsius temperature scales are examples of interval measurements (e.g., 100 degrees is not twice as warm as 50 degrees using either temperature scale). Ratio data, the highest level, contain all of the characteristics of interval data, except that a ratio scale uses a non-arbitrary zero point, which makes ratio comparisons possible; population density is an example of ratio-level data. The differences between interval and ratio data are small enough that they are often combined into a “numerical” data category, for which the methods of representation are the same. Perhaps more than any other data attribute, level of measurement determines which visual variable(s) are suitable or unsuitable for use, and the mapmaker should ensure a conceptually logical “match” exists between the two (Figure 1). Figure 1. The effectiveness of visual variables for each level of measurement. Adapted from MacEachren, 1994 and Slocum et al., 2009. Jacques Bertin (1967/2010) was the first to describe a system of graphic marks or visual variables by which map symbols could be used to encode information. Variations in the perceived differences of individual graphic marks allow mapmakers to encode qualitative or quantitative characteristics into each symbol. The strengths of the visual variable system are found in its parsimoniousness, adaptability, and ease of use. Over the years this system has been expanded upon to include additional static and non-static variables (e.g., Morrison, 1974; McCleary, 1983; MacEachren, 1995). Overviews of the visual variable system may be found in most introductory cartography textbooks (e.g., Robinson et al., 1995; Dent et al., 2008; Slocum et al., 2009). Presented here are six common visual variables: size, shape, color hue, color value, color saturation, orientation (Figure 2). Color is separated into three visual variables based on the human perception of color. 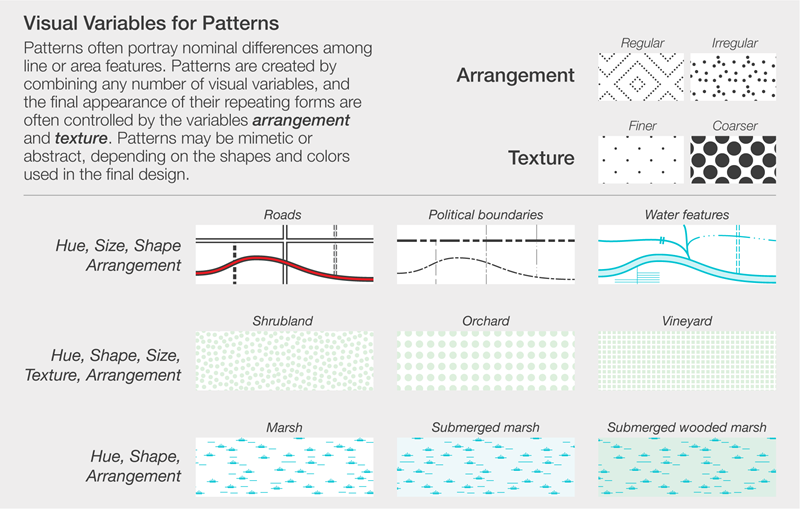 Also discussed are two visual variables associated with pattern design (arrangement and texture) and three associated with data uncertainty (transparency, crispness, and resolution). A number of animated and non-visual variables pertaining to sound, touch, and smell are discussed as well. While this list is not exhaustive, the majority of symbols fall within one or two of these classes. Figure 2. Common visual variables for point, line, and area phenomena. Adapted from MacEachren, 1994; Slocum et al., 2009; and Krygier & Wood, 2011. Table 1. Visual variables defined. Size refers to variations in the length, area, or volume of a symbol. Size is effective at representing quantitative information, particularly ratio-level data, because symbols sizes may be scaled to the data values they represent. Note, however, while size may be logically matched to ratio-level data, map readers often have trouble accurately estimating data values based on symbol size alone. Size is unsuitable for nominal data (size differences do not intuitively suggest categorical differences) or three-dimensional symbols (people are poor at estimating volumetric differences). Common uses include proportional or graduated symbol maps, flow maps, and cartograms. Shape refers to the appearance or form of a symbol. Shape is effective at representing nominal differences (e.g., a circle appears categorically different from a triangle), but unsuitable for quantitative differences (e.g., a circle is not inherently “more” or “less” than a triangle). Symbol shapes exist along a mimetic-abstract continuum: mimetic symbols appear to mimic the feature they represent (e.g., an airport represented by the outline of an airplane), whereas abstract symbols (e.g., a circle or plus sign) require a legend to decode their meaning. Color hue refers to the dominant wavelength of light in the visible section of the electromagnetic spectrum (red, orange, yellow, green, blue, indigo, violet). Color hue is the only color variable appropriate for representing qualitative information, as different hues suggest categorical rather than numerical differences in a data set. Color hue can represent ordinal and numerical data so long as the hues are limited in number and logically sequenced; for instance, yellow, orange, and red can represent low, medium, and high data values, respectively. Mapmakers should ensure that selected color hues are appropriate for colorblind audiences (Olson & Brewer, 1997). Color value, or lightness, refers to light or dark variations of a single hue; as a hue lightens (and holding color hue and color saturation constant), it appears pale or white. In the absence of hue, color value can be applied to shades of gray. Color value is commonly associated with quantitative data; typically, light shades correspond to low data values, and dark shades to high data values. The number of color values used in a scheme, and the perceptual “steps” between each color value, affect how efficiently a reader can decode the color values (Brewer, 1994; Harrower & Brewer, 2003). Color saturation refers to the intensity or purity of a single hue; fully saturated hues appear vivid or bold, and fully desaturated hues appear muted or neutral gray. Conventionally, color saturation is associated with ordinal-level data or uncertainty in data, although guidelines for the use of saturation remain less developed than for hue or value. More commonly, color saturation is used to enhance color hue or color value differences. Orientation refers to the direction or angle of rotation of an entire map symbol (for point features) or the individual marks that make up a map symbol (for linear, areal, and three-dimensional features). Orientation differences are readily discriminated, and thus effective at representing nominal information. Orientation is less suitable for quantitative information, as it generally lacks an inherent order, nor is any single direction emphasized over another. Common exceptions include analog clocks and arrows, which may use orientation to signify temporal and vector information, respectively. The six visual variables may be variously combined to create linear or areal patterns (repeated graphic designs). For instance, a pattern can be manipulated by changing the shape or orientation of individual marks comprising the pattern. The appearance of any pattern may be further controlled by two additional visual variables, arrangement and texture. Arrangement refers to the distribution or layout of individual marks that make up a map symbol, and may be described in terms of regular/irregular or uniform/random/clustered distributions. Texture, which refers to the relative fineness or coarseness of the areal fill within a map symbol, is a composite variable often defined as an interaction between other visual variables (e.g., MacEachren, 1994; Wilkinson, 2006). Generally speaking, arrangement and texture (and thus patterns) are best suited for representations of nominal information, although texture can suggest quantitative differences as well. Figure 3. Visual variables for patterns. All area patterns from the United States Geological Survey. MacEachren (1994) identified four visual variables for depictions of uncertainty regarding data quality or reliability: transparency, crispness, resolution, and color saturation. Transparency refers to the blend level between a map symbol and a background layer. Crispness, or fuzziness, refers to the sharpness of boundaries. Resolution refers to the level of detail or precision of a spatial data set. Color saturation is described in subsection 4.5 above. All of these have a continuum of reliability that runs from opaque, sharp, detailed, and saturated to transparent, imprecise, vague, and desaturated. Bear in mind these visual variables are not specific to uncertainty, and can be used to represent other data types as well (e.g., value-by-alpha maps use transparency to represent an attribute otherwise used to normalize choropleth maps). For more information on this topic, see the entry Mapping Uncertainty. Figure 4. Visual variables for data uncertainty. Note these variables can be used to represent information other than uncertainty. Most contemporary mapping software are capable of creating animated and dynamic maps, often featuring continuously changing map symbology which make use of dynamic “change” variables in addition to those used for static map displays. DiBiase et al. (1992) identified three principal dynamic variables for animated maps (duration, order, and rate of change) to which MacEachren (1995) added three more (display date, frequency, and synchronization). Others have since expanded the number of dynamic variables available for use (see Mapping Time). Mapmakers are also exploring ways to use our other senses (e.g., sound, touch, and smell) to convey geographic information and accommodate map readers with specific disabilities. Combining individual sensorial variables can create more immersive geographic interfaces and map experiences. Table 2. Dynamic and non-visual variables. Krygier (1994) examined two basic forms of sound (realistic and abstract) and identified nine abstract sonic variables (location, loudness, pitch, register, timbre, duration, rate of change, order, and attack/decay) to represent quantitative and qualitative geographic information. Griffin (2001) developed a haptic (touch) variable system organized around three broad physiological properties: tactile (sensed when our skin comes in contact with something), kinesthetic (sensed in the muscles, joints, or tendons), and visual analog (both visual and tactile). 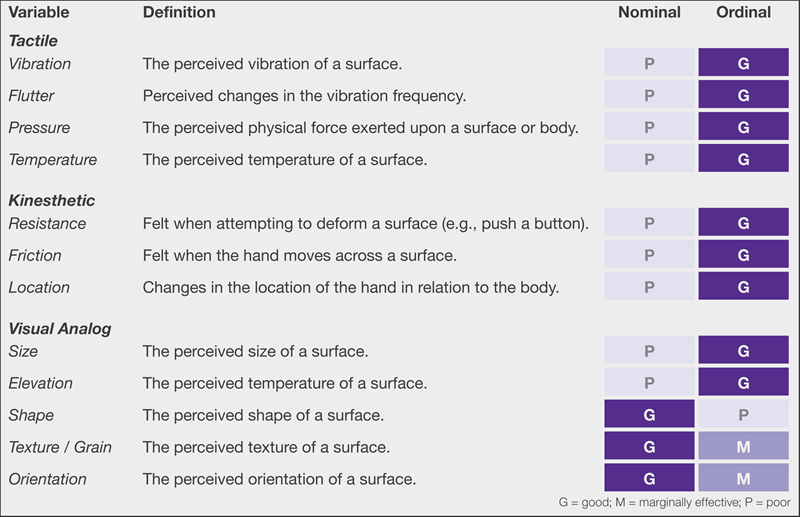 Four tactile variables (vibration, flutter, pressure, and temperature) and three kinesthetic variables (resistance, friction, kinesthetic location) can effectively represent ordinal-level data. Five visual analog variables were derived from existing cartographic visual variables: size and elevation (for representing ordinal data), shape (nominal data), and texture/grain and orientation (both nominal and ordinal data). Odors may also be encoded with geographical meaning, although cartographers have yet to develop a set of smell variables. For instance, we associate particular odors with phenomena that have distinct spatial or temporal dimensions (e.g., campfires and annual spring blooms). One current constraint of smell research is the limited availability of hardware and software capable of generating odors. Figure 5. Combining multiple visual variables to create redundant symbolization. Cartographers frequently combine visual variables to provide redundancy within a symbol (Figure 3). Redundant symbols use two or more visual variables to portray a single geographic attribute or feature, such as using both size and color value to represent gross domestic product on a proportional symbol map. Situationally, redundancy may help the map user interpret a particular symbol or perform a specific map activity; however, the effectiveness of this technique is debatable, and therefore redundant symbols are uncommon. Visual variables may also be combined to encode a symbol with multiple data attributes; see Bivariate & Multivariate Mapping for more information on this topic. Bertin, J. (1967/2010). Semiology of Graphics: Diagrams, Networks, Maps. trans. W. Berg. Redlands, CA: ERSI Press. Brewer C. A. (1994). 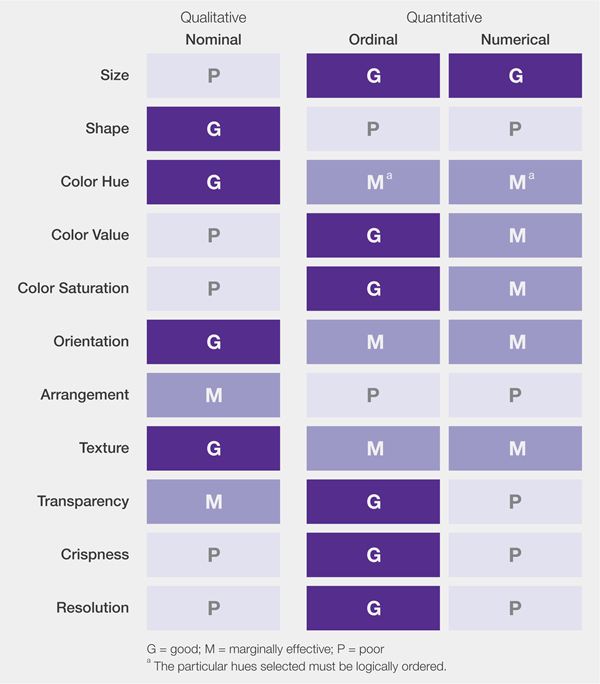 Color Use Guidelines for Mapping and Visualization. In MacEachren A.M., Taylor D.R.F., editors. Visualization in Modern Cartography. Tarrytown, NY: Elsevier Science; pp. 123–147. Dent, B. D., Torguson, J. S., & Hodler, T. W. (2008). Cartography: Thematic Map Design. 6th ed. Boston: McGraw-Hill. DiBiase, D., MacEachren, A. M., Krygier, J. B., & Reeves, C. (1992). Animation and the role of map design in scientific visualization. Cartography and geographic information systems, 19(4), 201-214. Krygier, J. B. (1994). Sound and geographic visualization. In Visualization in Modern Cartography. A. M. MacEachren and D. R. F. Taylor (Eds.). Oxford: Pergamon, pp. 149-166. Krygier, J., & Wood, D. (2011). Making maps: A visual guide to map design for GIS. New York: Guilford Press. MacEachren, A. M. (1994). Some truth with maps: A primer on symbolization and design. Association of American Geographers. MacEachren, A. M. (1995). How maps work: representation, visualization, and design. Guilford Press. Morrison, J. L. (1974). A theoretical framework for cartographic generalization with the emphasis on the process of symbolization. International Yearbook of Cartography, 14(1974), 115-27. Robinson, A. H., Morrison, J. L., Muehrcke, P. C., Kimerling, A. J., & Guptill, S. C. (1995). Elements of Cartography. New York: John Wiley and Sons. Slocum, T. A., McMaster, R. B., Kessler, F. C., & Howard, H. H. (2009). Thematic Cartography and Geovisualization. 3rd ed. Upper Saddle River, NJ: Pearson Prentice Hall. Wilkinson, L. (2006). The grammar of graphics. Springer Science & Business Media. Describe the variables used in the symbolization of map data for visual, tactile, haptic, auditory, and dynamic displays. Design symbols that appropriately relate spatial dimension of mapped features to the level of measurement of the attribute information being mapped. Deconstruct and critique the symbol-referent relationship of a given map symbol. Evaluate the effectiveness of a map’s symbology based on the underlying nature of the data and the visual variables used to represent those data. Design a map with symbols that appropriately represent a given dataset and produces an effective visual hierarchy. Consider the categorization of visual variables based on their effectiveness at representing qualitative or quantitative data. Can you identify a situation where a qualitative visual variable would be appropriate for representing quantitative information? Explain. Can you identify a situation where a quantitative visual variable would be appropriate for representing qualitative information? Explain. One strength of the visual variable system is that new variables may be added without changing its underlying structure. How might emerging technologies such as virtual reality affect this framework? Identify a variable that may become commonplace in the future. In terms of spatial dimension and levels of measurement, which sort of data could it effectively represent? Identify which symbols appear universal or near-universal. Describe the qualities that allow these symbols to be decoded regardless of the map reader’s cultural background. Identify which symbols appear culturally-specific. Describe the that may prevent these symbols from being decoded because of the map reader’s cultural background. Three symbols for each phenomena, each using a different sensorial variable (visual, auditory, haptic). One redundant symbol for each phenomena using a combination of sensorial variables. One bivariate symbol for both phenomena using a combination of visual variables. Keates, J. S. (1996). Understanding maps (2nd ed.). Harlow: Addison Wesley Longman. Muehlenhaus, I. (2013). Web cartography: map design for interactive and mobile devices. CRC Press. Tufte, E. (1990). Envisioning Information. Cheshire, CT: Graphics Press. Ware, C. (2013). Information visualization: Perception for design. 3rd ed. Amsterdam: Elsevier.